Work the netting for the central part of the necklace (Fig.1). 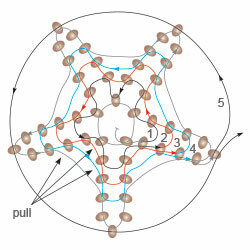 Work the ropes, using Figure 2 as a guide. 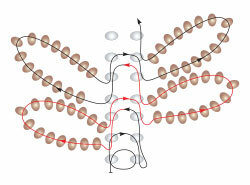 Work two loops for a clasp at the end of one of the rope, using I (Fig.3). 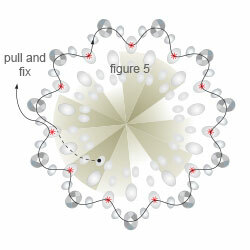 Work a ball, using I, and attach it to the other rope (Fig.4). Take a length of thread and pick up 22G. Bring them down to the middle of the thread and close them into a ring. Go through all the beads one more time. 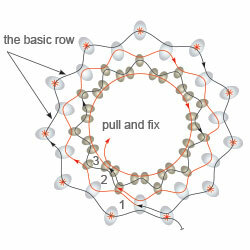 Work in circular peyote stitch (Fig.5). Go through the last row for several times, pulling tightly on the thread. Tie off the thread tail but do not cut off. Pick up the loose thread tail and work one row in G, insert the rivoli top side down, work two rows, pull the bezel of the rivoli (Fig.6). Tie off the thread tail but do not cut off. Work all A rivolis in the same way. 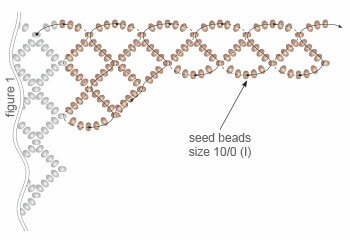 Bring the thread to any G seed bead of the 1st row (Fig.6). 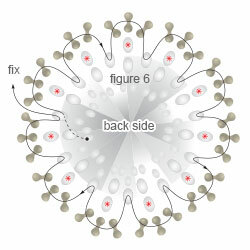 Work one row in F (Fig.9). Pick up the first thread tail and embroider the top side of the rivoli, using J, F (Fig.8). Embroider two A rivolis in the same way. 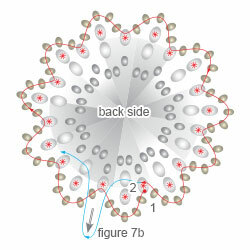 Embroider the top side of the third A rivoli in the same way (fig.8). Pick up the loose thread tail and embroider the rivoli (Fig.7a and 7b). Work C rivolis in the same way but pick up 16G instead of 22G. Embroider the top side of the rivolis (Fig.8). 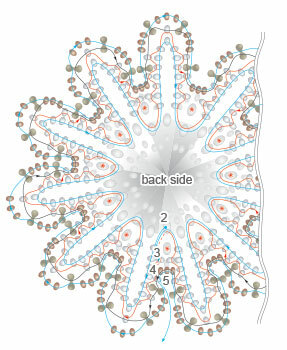 Use figure 9 as a guide to embroider the back side of the rivolis. 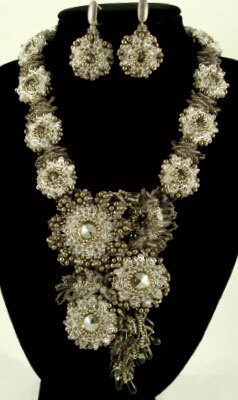 You will need two kinds of the branches for the necklace. 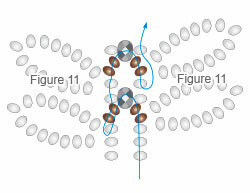 Work two branches, using H, C, D (Fig.10). 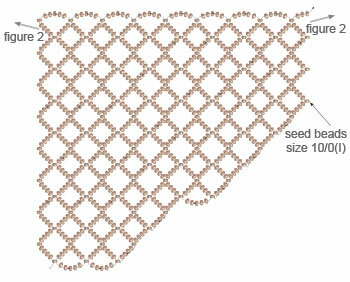 Work the other branches, using J, I (Fig.11) and embroider, using figure 12 as a guide. Sew A rivolis to the central part of the necklace base (see the photograph). Fill in branches the free space between the rivolis. Attach B rivolis to the ropes. 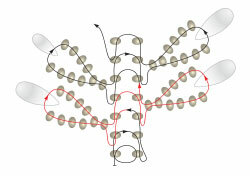 Fill in loops of I the free space between the rivolis onto the ropes. 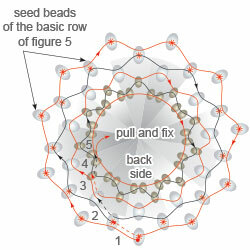 Bead around 2B in the same way (Fig.5, 6). Embroider the rivolis (Fig.8, 9). Attach the beaded rivolis to the ear findings.